Simple interest is normally expressed as a percentage and is normally used to show what either has to be paid to borrow money or lend money. By borrowing / lending the principal amount (the loan amount) you would normally expect to receive something in return or pay something because of this loan. 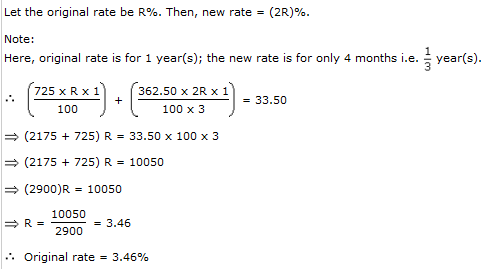 This is normally expressed as a percentage and is called the simple interest rate. There is also something called the Compound Interest Rate Formula but that you can read more about in the link just provided. Now let's look at some questions using this newly learnt simple interest formula. A sum of 12,500 amounts to 15,500 in 4 years at the rate of simple interest. What is the rate of interest? Explanation: S.I. = (15500 - 12500) = 3000. A sum of 725 is lent in the beginning of a year at a certain rate of interest. After 8 months, a sum of 362.50 more is lent but at the rate twice the former. At the end of the year, 33.50 is earned as interest from both the loans. What was the original rate of interest? Explanation: Principal = Dollar (100 x 5400)/(12x3) = Dollar 15000.